How do you get your parents to ground you for life? Well it's quite simple really... just take their $250,000 Ferrari out for a joyride and split it right down the middle into two. Amazingly, the driver and his passenger walked away free from the wreckage without serious injury. 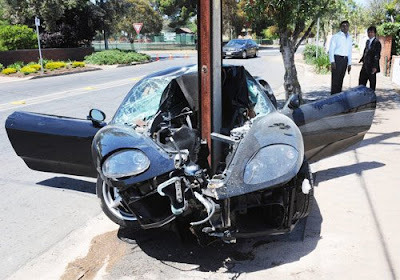 They were both taken to the Royal Adelaide Hospital suffering only minor injuries after leaving the expensive 360 modena model literally "wrapped around a pole". Witnesses reported that the car was "zinging" around suburban streets in Walkerville, Adelaide just minutes before the incident. One witness, known as Vlado, said "I was outside my house talking and we heard something fly up and it was this black Ferrari. It sounded just like, 'zing, zing', as it want past". Vlado then walked "two blocks" around the corner when he saw a fire truck arrive. It was there that he saw the Ferrari smashed against the pole. He said the men were "lucky to be alive. The Stobie split the car in two and it's basically up where the gear stick should be". Goes to show God looks out for Babies and Fools. And since they had a license to drive they ain't no babies. A bunch of "stew pig" ('stupid' with a fast-tongued, Singaporean-Hokkien accent) fools, I must say !! !